Jose Mijares attended the Escuela Nacional de Bellas Artes San Alejandro (Havana, 1938-1942), where he took classes with Professors Leopoldo Romañach and Armado Menocal. His first solo exhibition took place at the Conservatorio Nacional Hubert de Blanck (Havana, 1944). As an illustrator, he collaborated regularly in the magazine Origines, edited by José Lezama Lima, and in 1950, he received the First Prize at the Salón Nacional de Pintura, which awarded him a scholarship to study in New York. Mijares began as a figurative artist. In 1953, he started his experiments in concrete abstraction, and between 1958 and 1961, he belonged to the group Diez Pintores Concretos that gathered at Loló Soldevilla and Pedro de Oraá’s Galería de Arte Color-Luz. He participated in the making of the serigraphs 7 pintores concretos (1960) and A (1961), and together with the members of the group played a fundamental role in the diffusion of abstract-geometric art in Cuba. Between 1959 and 1960, Mijares taught at the Escuela Nacional de Bellas Artes San Alejandro, and in 1960, he painted a great mural for the Museo Nacional de Bellas Artes (Havana). His works of this period were characterized by the use of the color planes that seemed to fight amongst themselves for predominance. His attempt to find perfect balance in color planes culminated in his work of the mid-1960s. In 1968, Mijares went into exile in Miami (Florida), where, through melancholic forms, blue tones, great sensuality and even fantastic elements, he returned to figurative painting with works that expressed his nostalgia for Havana. Between 1968 and 1973, he joined the group Gala, and later, in 2002, he opened his own art gallery in Coral Gables (Florida, United States). Diez Pintores Concretos- Group founded in Havana in 1958. The group had its headquarters at the Color-Luz Art Gallery in the Cuban capital, which had been opened a year earlier by Loló Soldevilla and Pedro de Oráa. 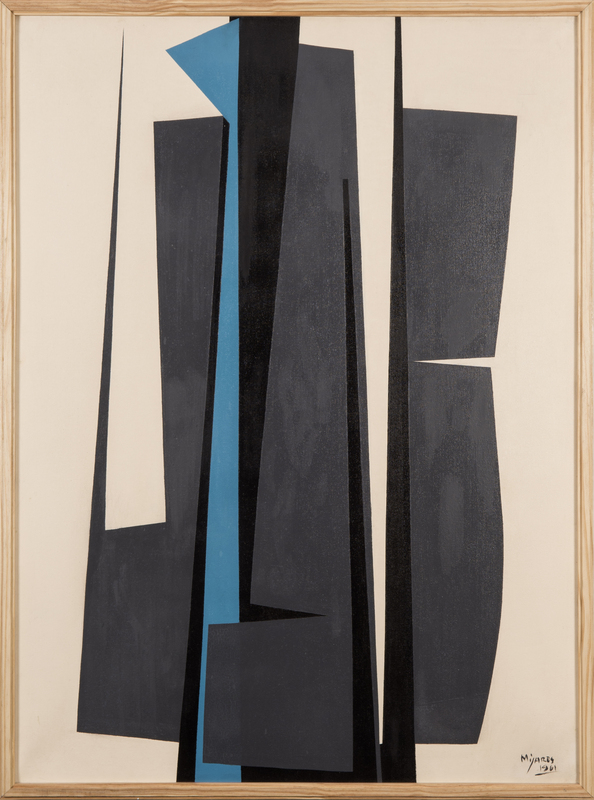 They played a crucial role in spreading in Cuba abstract-geometric art that was fully in line with what was being done in the capitals of the art world. The group disintegrated when the gallery closed in 1961. Beyond Soldevilla and Oráa, its members were: Pedro Álvarez, Wifredo Arcay, Salvador Corratgé, Sandú Darié, Luis Martínez Pedro, José Mijares, Rafael Soriano López and José Ángel Rosabal.